Merlin Bath Seat - 6 Inches. The Merlin Bath Seat is supplied in a choice of 3 sizes. This is the smallest and our most popular model. Ideal for people who struggle to sit in the base of the bath, it makes it much easier to get in and out and makes bathing more comfortable. 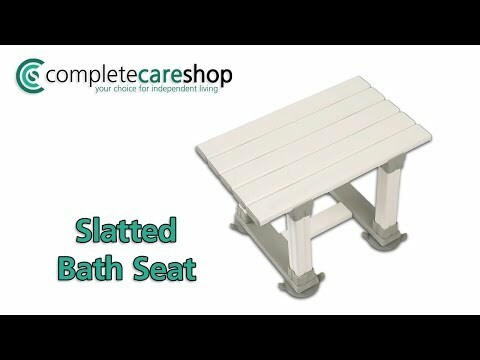 Built from reinforced PVC, it has a slatted top for quick and free drainage, and it affixes to the bath using quick release suckers. Absolutely delighted with this stool. Both my wife and I are of the older generation and we're finding it a bit difficult to get out of the bath but this stool has made it so much easier and we both feel much safer using this. A truly excellent buy. I purchased this as I am almost 80 and needed an easy way of lowering myself into the bath. This is brilliant as I just go partway then go lower. It is excellent for getting out of the bath. No need to roll on my tummy and onto my knees which is how I have been doing it. The service at the Completecareshop iwas great as usual.